I’ve been use Elementary OS as my primary laptop OS over a year and have been written some posts for it. I Upgraded to Elementary OS Juno at December last year. Juno is based on Ubuntu 18.04, the experience is very positive. Most things works fine and not much things need to tune for daily usage. Here’s my setup for my Dell XPS 13-9360 laptop. The Bluetooth connectoin is basically stable. No need for extra setup. To make right click works for Touchpad, go Settings >　Mouse & TouchPad, select from MultiTouch to TouchPad in Physical Click section. To use logitech mouse with unifying USB dongle, you can do sudo apt install solaar solaar-gnome3 and there will be solaar-cli command line tool and the GUI tool available. Then create the config file using xbindkeys --defaults > $HOME/.xbindkeysrc. tlp is a good tool for auto power management and now it can be installed through the default repo. Go Settigns > Monitor > Night Light to toggle it on. Instead of configure by yourself. It’s build-in now. Select Traditional Chinese during install Elementary OS. Enter System >　Language & Area > Keyboard Setting > Input Method Settings. Remove all other IME except 新酷音 and it just works. Then open Tweaks in System Settigns panel. There are many ways to access Bitfinex API to get most of Bitfinex exchange functionalities. For example, you can access REST API, websocket API, or call the language specific API library to eaze the interaction efforts. But in my opinion interact via Node-RED Bitfinex function block is the most easiest one. install Node-RED npm install -g node-red. search bitfinex to install this module. Node-RED is a great way to interact with everything online, with a more intuitive interface. 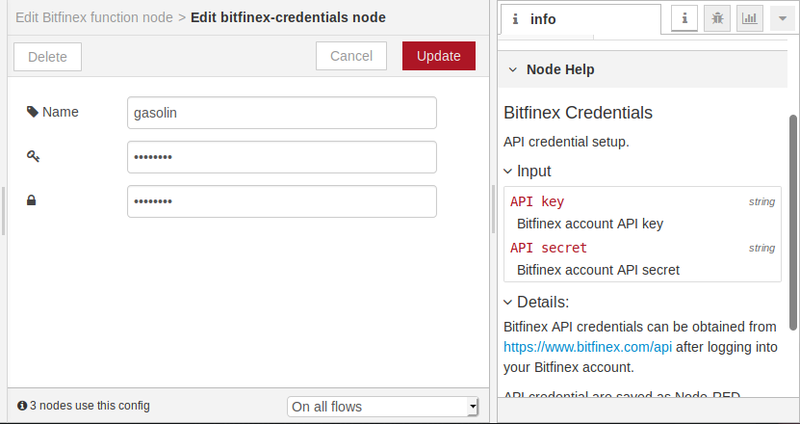 To simplify the interaction with Bitfinex, I wrapped the Bitfinex function block for Node-RED, which makes bitfinex API very easy to access in Node-RED. You can visually show exchange data in node-red’s dashboard, mashup with other services, or trade from weird objects around your house. For example, you can follow the screenshot to make below REST API work. You can use configuration block to put your apiKey and apiSecret. You may not know the tickers api) allow query multiple symbols at once, like rest.tickers(['tETHUSD', 'tBTCUSD']) and this functoin block supports multiple outputs as well! For reference, You can learn more ways to access the Bitfinex API below. But for more complicated interaction like place an order with authenticated API, we generally prefer to call language specific library to simplify the process. The Bitfinex official doc listed several open source language specific libraries for developers. to get same result as directly call the REST API on the browser. Though You may not know the node API build-in the data model mapping, which saves you from manually parsing the returned result. If you want to access authenticated APIs, just pass the apiKey and apiSecret when construct the bfx api instance. The API call seems not hard but it did require some effort to make all works. Disclosure: I am currently working on Bitfinex. Node-red-contrib-bitfinex is the personal project though.